There are two recipes that I call my very best friends. Both have been with me for many years and created countless moments of utter bliss. The first is the Most Perfect Cinnamon Fruit Crumble Cake (see page 196) and the other is this quiche with the most buttery, flaky crust. It's as versatile as pizza, so you can use different vegetable and cheese combinations. 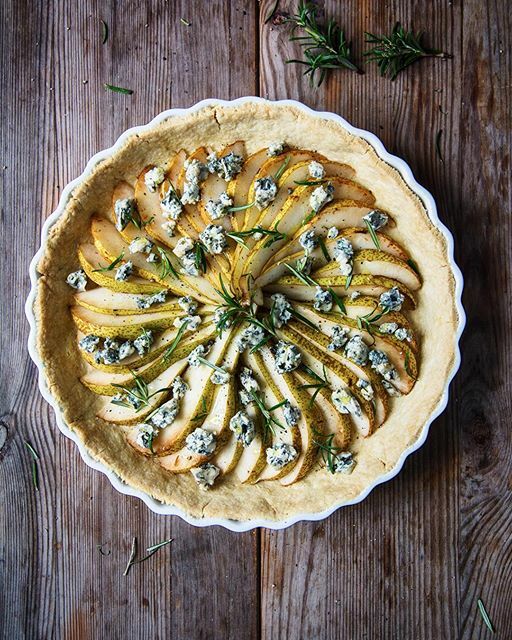 Filling the pastry with pear wedges, crumbled blue cheese, and rosemary, is a minimal take on the recipe. It's an elegant savory tart, great for picnics, brunches, or as a starter for dinner. I always blind bake my crust, though I have to admit, I often skip the recommended step of lining the dough with dried legumes. Instead, I just prick the dough with a fork to keep it from bubbling up, but the choice is yours.